Before my friend John and I jumped the 7 train to head out to see the revival of Jeanine Tesori’s Violet, I had spent 30 minutes flat ironing my curls and searching for the left dangly earring that I was missing. My contact slightly burnt in my right eye. And after all that, I still didn't necessarily feel beautiful. I was not prepping for anything in particular. I felt like, to go to the theatre I was put together and had fulfilled my obligation to appear as such. This heartbreaking story about a young woman named Violet, whose only dream is to be in the skin of another, resonated strongly with me. I began to question my prior routine of burning my curls and forsaking my glasses simply because it has been ingrained in me to devote time to this! Violet follows the journey of a melancholy woman who, as a young girl, was impaled by the loose blade of her father’s axe. I had already known that Sutton Foster would not be adorned by prosthetic or facial makeup. So, the second she walked onstage, I saw the actress (renowned triple threat that I have looked up to … forever), however, her physicality as a woman with shame and a lack of self-love came across so strongly for me. I watched her slump her shoulders and wince as others looked at her. I began to think about the way that I carry myself. Violet always believes that she knows how others perceive her and I could understand that constant evaluation of the minds of others. I felt myself sitting up a bit straighter and later taking my hand away from my face, something I usually do. Initially, I was really focused on the character of Violet. I was anticipating the judgment of others that would be thrust at her. I felt connected to her past too because of intermingled flashbacks that involved Violet and her father. I felt myself moving between pity and complete empathy, and my heart was most with Violet when she was fighting her father or trying to connect to her late mother. However, when Flick (Joshua Henry) sang "Let it Sing" - this show for me became completely about him. My eyes constantly darted to him onstage. Flick's sentiments towards Violet felt genuine and his zeal for life felt real. I could tell that in each-other's presence, both Violet and Flick felt beautiful. To be honest, there were songs in this show that told the story a bit differently than I am used to and that slightly confused me. 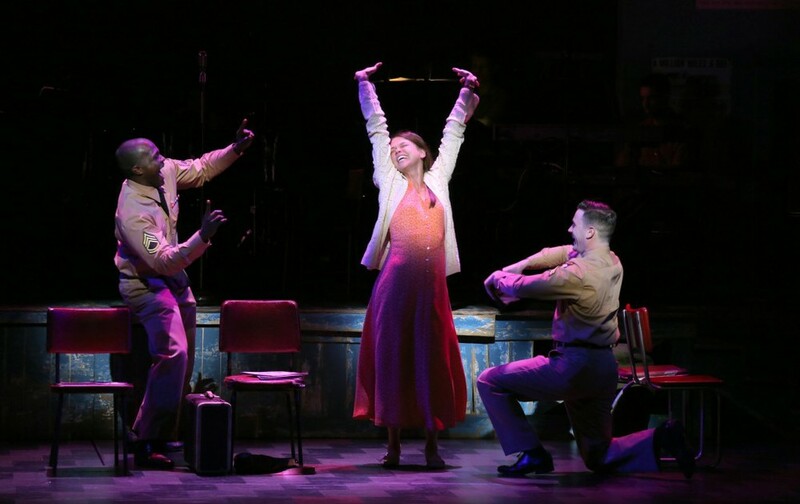 For example, at one point many ensemble members sing "Who'll Be The One (If Not Me)", a crooning country love-song. The protagonists were not engaged in this song and I found myself split between wanting to know what they were thinking and what the song was conveying in the background. Though Violet is an older piece, Violet's yearnings are so relevant to those of young girl's today. It reminded me greatly of this quote my service homeroom teacher shared with me once. Here Lies Love. You did what? Mixed immersive and musical?